Bearden’s in Rocky River is a Cleveland institution. 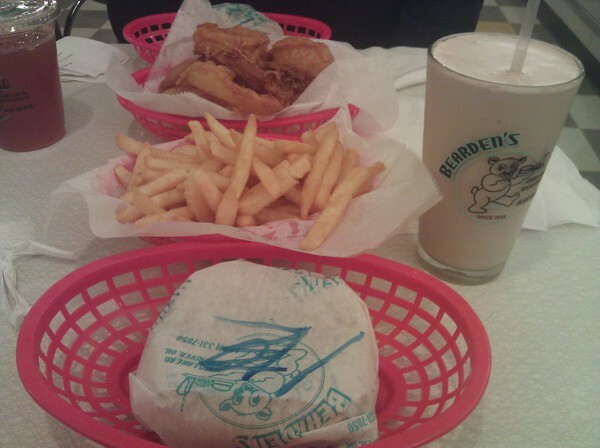 Opened in 1948, Bearden’s is known for its bear logo, steakburgers and shakes. It closed a couple years ago when construction on Lake Road caused business to dry up. It reopened this past October. 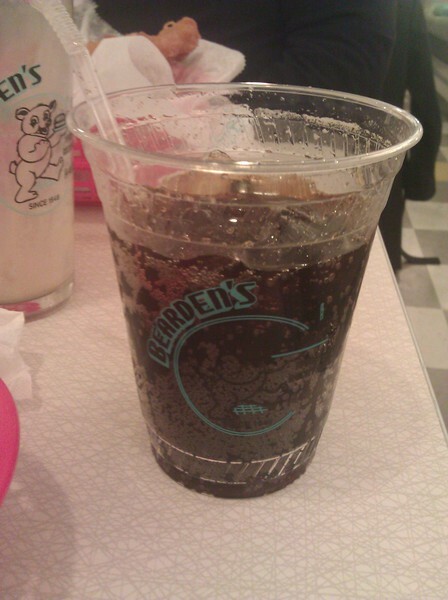 Most West Siders have a story about Bearden’s. I remember going to Bearden’s with my high school boyfriend on our first date. There was some discussion the night I went as to whether it was the original location. My friend and I remember it being much darker than it is now. I seem to remember wood paneling, and my friend Suzanne insists it was at the end of her grandmother’s street. Maybe there were two locations at one time. Who knows. In any case, the new Bearden’s is much brighter, but the iconic train with its stuffed bear conductor is still circling the dining area. Bearden’s is not fancy dining by any stretch of the imagination. In fact, my fellow diners weren’t that impressed with the fare. If you are used to burgers at B Spot, Greenhouse Tavern or Whitey’s this place may not be for you. However, if you like Steak and Shake you’ll feel right at home. 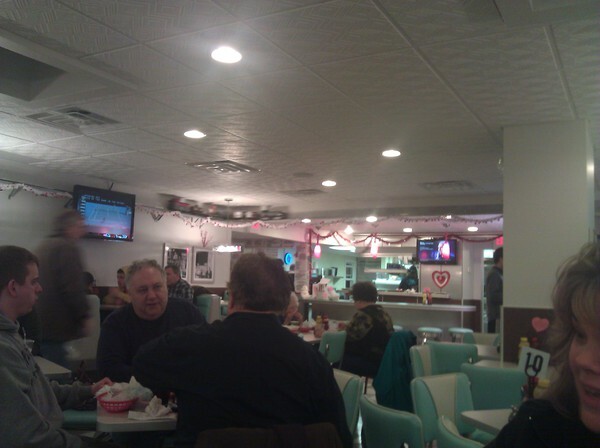 Kids adore it and it is good for a stroll down memory lane, eliciting the old 1950s diner vibe. When I mentioned on Facebook that I would be dining at Bearden’s several of my friends mentioned the peanutburger, so of course I had to try it. I would have never thought creamy peanut butter spread on a burger would be tasty, but it wasn’t bad. 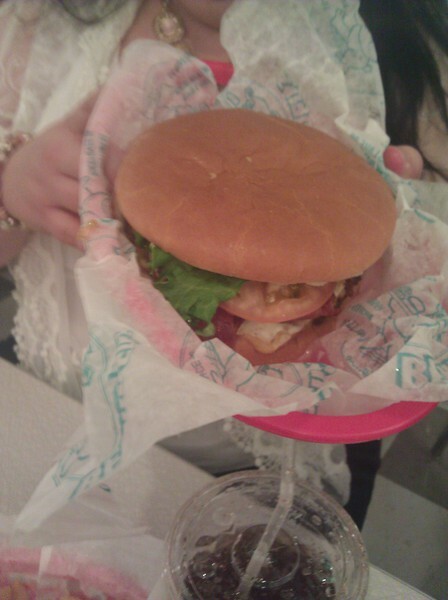 If I were to go there again I would definitely order bacon with the burger. The chocolate milkshake was definitely a nice accompaniment to the peanutburger for this Reese’s Peanut Butter Cup fan. Everyone at our table shared sides of golden fries and thick onion rings. My fries were quite tasty, with just the right amount of salt. The onion rings are fresh and not frozen. One side of fries or onion rings can easily be shared by two or three people. The Plain Dealer’s Friday! magazine recently reviewed Bearden’s, and I wouldn’t be surprised if she was there the night after we were. I distinctly remember the valentines on the windows too. I was particularly thrilled to see that they offer birch beer on tap in the self-serve soda fountain. It’s one of my all-time favorite drinks from childhood, and you can’t find it everywhere.